CIO attitudes have dramatically changed in the past three years – from “public cloud isn’t secure,” to “We’re moving everything to public cloud in the next three years.” While a bold ambition, it’s not realistic (nor good strategy) for most enterprises. The better approach is to recognize your business will be hybrid for the foreseeable future; the focus should be on determining the right uses of public cloud and moving now. Extending your data center to the cloud lowers cost, enables global reach, and inexpensively and securely provides powerful new functionalities. Where five years ago IT executives approached the cloud with skepticism, today it is accepted as a key component of both IT and business strategy. But a wholesale move of hundreds or even thousands of applications from a company’s data center may result in higher costs and more risks. In fact, while the cloud offers many benefits, compelling reasons may dictate that some applications or data should remain on-premises short term or permanently. For example, it may be simpler to keep a heavily used but extensively customized SAP application from 1986 on-premises rather than try to rewrite it as cloud native. Compliance or regulatory demands may also require certain data be managed locally. Even if neither of these is the case, enterprises must still prioritize which applications move first, and which later. 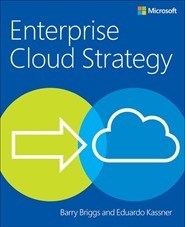 Barry Briggs, former Microsoft IT CTO and a technology thought leader, and Eduardo Kassner, the executive in charge of Microsoft’s field Cloud Solutions Architects, wrote about this transition in their book, Enterprise Cloud Strategy, a free download from Microsoft Press. During the periods of migration of real Azure customers described in the book, the most common best practice is for some applications to remain in the data center while others move to the cloud. Prioritizing your portfolio: Where do I start? Need for elasticity. Many applications have patterns of consumption that fit well with on-demand resource allocations (which triggers the benefits of cloud economics). Think about an employee performance review application: it might only be used twice a year, but during those periods usage is very high. Such an application is ideally suited to the dynamic scale out nature of the cloud: as usage grows, more compute resources are added; and as the review season closes, those resources are no longer needed. In other words, you only pay for what you use. Size and interconnectedness. It’s often easier to move smaller applications to the cloud, and also those that are less integrated with other applications. For example, a portal promoting a new offer will typically be more self-contained, and smaller, than that 1986 SAP ERP monster. Data sensitivity. Think about prioritizing applications with less sensitive data first. Make sure, by the way, that you include your Information Security and Risk Management teams as you think about this. Having an enterprise-wide data classification scheme (low/ medium/ high business impact, for example) will help you. Marketing and product information sites are prime candidates for early migration; applications that maintain customer PII (Personally Identifiable Information, such as address, social security number and email address) should be reviewed by your risk and security teams for example. These are just a few of the dimensions along which you can analyze your ecosystem; Enterprise Cloud Strategy provides a detailed suggestion list of many more. This is also an excellent time, by the way, to consider taking advantage of SaaS applications to dramatically lower your costs. Commodity functions – such as email, collaboration, and CRM – that do not competitively differentiate your company are excellent candidates for SaaS. Enterprise Cloud Strategy also provides suggestions and guidance for how to organize a Cloud Strategy team to bring together all the relevant resources: from technology teams to security and risk management, finance, operations, business unit management, HR, and others to build a cohesive and actionable plan; and then to execute the plan. I hope you’ll check it out! Next week I’ll describe how exactly to go hybrid cloud, that is, how to get the most from blending applications regardless of where they are hosted, to work together as a cohesive, integrated ecosystem.